I’ve waited over a year to paint this scene – the early evening colors of winter at the farm in its natural surrounding really attracted me. This painting may well be a contender for our Christmas card. Winter Quiet, an oil pastel (8×10) is painted on a gesso-prepared hard board, using Holbeins and Mungyo-Gallery brand oil pastels – both soft in application, but not so that they fill up the surface tooth too quickly. The painting started with an acrylic underpainting (ultramarine, payne’s gray and white) to establish values. My fingers, clay shapers and a painters knife were used to spread and blend the oil pastels. A lot of negative painting and scraping took place to develop the cloud structures. Hope our friends in Buffalo, NY can withstand the next round of snow about to hit them – 8′ of snow is nearly impossible to shovel. Snow can be really beautiful, but too much of a good thing, well . . . The reference image was taken by my friend Elena’s (an incredible artist at PMP) Mother. The photograph was taken one evening in Germany when she was out exploring the countryside, she happened to come upon grazing sheep. This entry was posted in About Oil Pastels, OPs New Paintings and tagged oil pastels, painting, sky, snow, trees, winter. Bookmark the permalink. Way too beautiful!! Your artwork makes my soul flutter. Thank you Eva for your generous comments – see you in January! It looks really cold, great! Thank you so much – glad you could feel the winter cold, it’s a compliment. So beautiful! The sky in particular … it gives you the idea of … a floating winter. Thank you Francesca – winter skies are so different, sometimes fluffy with pinkish/gray tones cast about in the clouds, but usually as you say “floating” feel. Enjoyed your comment! Hi Poppy, yes and I’m thrilled you enjoy the warmth of this winter scene. I was going to put a bit more ochre w/n in the sky and around the shed for added warmth to the scene, but at the end it didn’t seem to fit. So glad you still feel the atmosphere intended. Hi Gloria!! Thank you – have a great weekend. This painting has that feeling of winter silence to it. Yes! Great for a christmas card! Thank you Leslie! You words of “winter silence” was exactly what I thought when I was painting the scene – all quiet and hushed. Thanks Rhonda – the sky was a whole lot of fun painting (can’t tell you how many layers were painted on, scraped off and layered back again, plus at the end I did a little negative sky painting to help the clouds pop some). There are colors in the sky I just love. Thanks again!! Its lovely Mary. I can see why it is the front runner for your Christmas card. Such a peaceful scene. Hi Susan, thanks very much! Two or three more to go and then we’ll decide. I’d love to be inside the little house. I love the warm and cool-contrast at its best. Hi Elena, thank you so much – I’m glad the painting was inviting. Appreciate that you saw the atmosphere contrast in the scene, you have an amazing artistic eye. Thank you Nia for your wonderful comment – glad you liked the painting. Have a lovely weekend, happy hunting for photo scenes. It is beautiful and somehow incredibly peaceful. Thanks Malvika – so glad you enjoyed it. 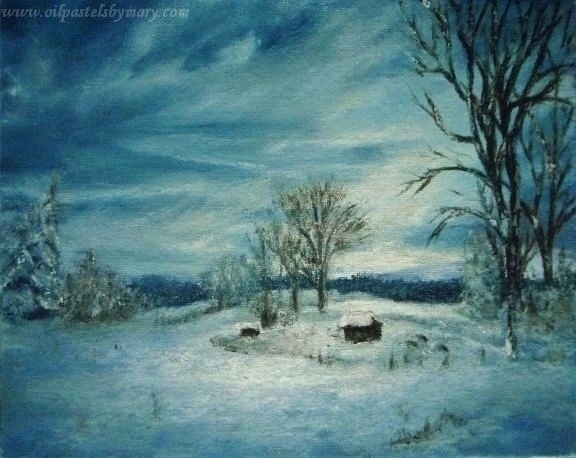 I think it’s the blue that gives us a quiet and peaceful feel to snow scenes. Oh, it is so so utterly gorgeous!!! 🙂 🙂 I ❤ it! Beautifully cool with such mystery. Love the blue. Thank you Don, I like your description at lot. Glad you like the blue, it really appeals to me for winter scenes. I can see this on a Christmas card. Love the way the fence and grasses are partially exposed. Thanks Frank, so glad you enjoyed this piece – I really appreciate that you notice the details. It is a front-runner, but I’ve got two more paintings to go and then the big decision. Hi Elizabeth, thank you for your beautiful comment – it is so true, the blue look is surreal which is why I think it appeals so much to me. Thanks again! Thanks very much Marina for your lovely comment. Have a beautiful weekend. Very nostalgic and romantic, Mary, like a moody-blue longing to return to a simpler time and place…a very Mary christmas! Ha Cynthia, didn’t pass by me – thank you so much and glad you enjoyed this “blue” scene. I love your description, which is what prompted me to paint the scene. A very Mary Christmas back to you! Outstanding Mary, I mean that cloud structure is just absolute perfection! This is one of your most beautiful winter scenes yet, I can just imagine what’s coming up! I would definitively like to receive a Christmas card just like this one in my mail box! Have a wonderful weekend Mary! This is most certainly what I would want on my Christmas Card – and the light, happy clouds tell of the cold air. Hi Ann-Christine, thank you so much – this may be a front runner. Never know I’ve two more to paint. So beautiful, Mary. It has my vote!